A recent episode of BBC Radio 4’s In Our Time examined the development of the microscope, an instrument that of course revolutionised how we ‘see’ the world at a granular level. The programme’s presenter, Melvyn Bragg, was joined by three notable guests, Jim Bennett (Visiting Keeper at the Science Museum in London), Sir Colin Humphreys (Professor of Materials Science and Director of Research at the University of Cambridge), and Michelle Peckham (Professor of Cell Biology at the University of Leeds), who discussed the early development of the optical microscope in the seventeenth century, its centrality to scientific enquiry by the nineteenth century, and then developments of the electron microscopy from the 1930s, which today is one of the most powerful tools of modern science. The invention of the microscope is varied, but one prominent pioneering scientist was Robert Hooke in England, whose publication Micrographia: or, Some physiological descriptions of minute bodies made by magnifying glasses : with observations and inquiries thereupon (1665) was the first major publication of the Royal Society, and indeed the first scientific best-seller, gaining the instrument wide public interest. The book is also notable for first coining the biological term cell. However, of particular interest for the study of images, is the suggestion that Hooke drew what we might now call atoms. 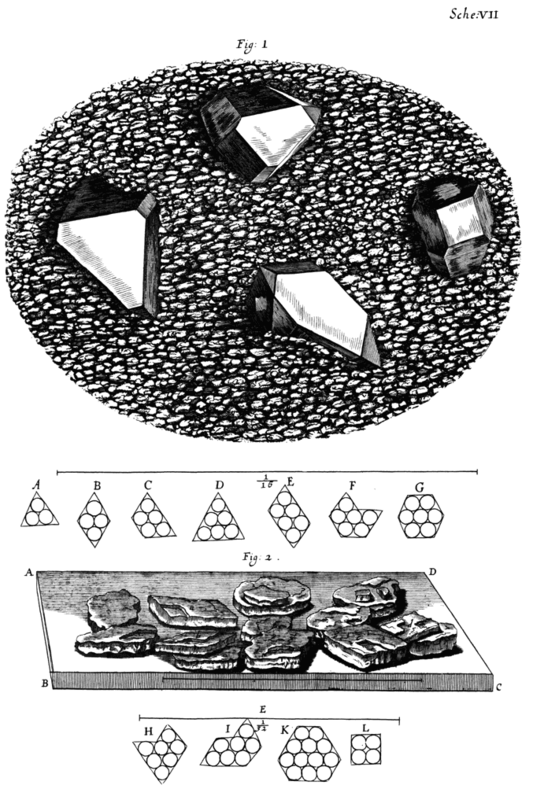 This is an engraving of 4 crystals of different shapes at the top. Underneath this there are sketches by Hooke of different shaped crystals with spheres inside, showing how different arrangements of spheres can give rise to the crystal shapes. It seems to me that Hooke would not have made these drawings unless he thought the crystals contained such spheres inside them, and he surely must have been thinking that these spheres were atoms. (You can listen to the full discussion about the history of microscopy on BBC Radio 4’s In Our Time).